Welcome back to another fantastic day of D&D: Let's Roll! 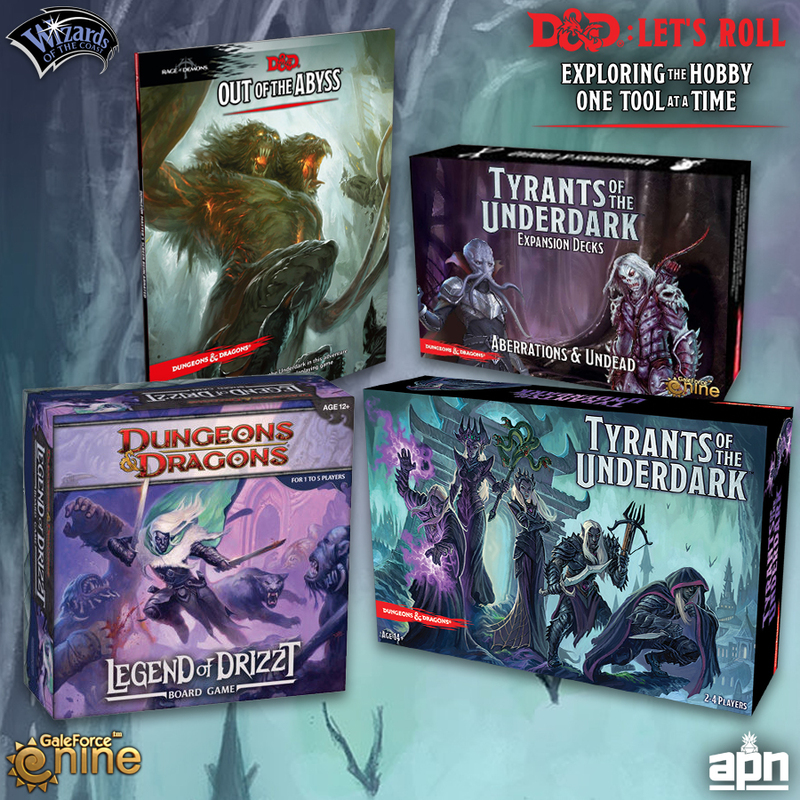 Today we are journeying deep into the Underdark to talk to you about two board games from Wizards of the Coast that can help you decide if the Out of the Abyss campaign is right for you! Legend of Drizzt from Gale Force Nine follows along with the book series of the same title. The board game, published by Wizards of the Coast, utilizes the same system as Wrath of Ashardalon and Castle Ravenloft so if you've played those titles, you'll be able to jump right in. In this game, you can play as Drizzt himself along with various other companions from the book series. Much like Out of the Abyss, the characters are attempting to escape the horrors of the Underdark and will face classic enemies from the setting, making this a great analogue for the starting events of Out of the Abyss campaign. Learn more about the game from Wizards of the Coast and Rodney Thomson. In Tyrants of the Underdark - also by Gale Force Nine - you can take a deep dive into Drow Culture! The rule book comes chock full of interests facts about the dark elf culture, which is something you'll have to contend with in Out of the Abyss. Unlike many of the other adventure or campaign based co-op games we've talked about so far in Let's Roll, this is a deck building and area control game. This game and its expansion Aberrations and Undead, however, does include many of the characters and foes you might come across in Out of the Abyss, giving you a chance to get your bearings before you start a campaign which hangs its hat on epic dark fantasy, horror, and madness. Learn more from The Dice Tower! We are thrilled to announce that for the next four weeks we are going to featuring a veritable hoard of Dungeons & Dragons content here at Active Player Network! On Monday, July 23rd, 2018, Hasbro CEO and Chairman Brian Goldner pronounced this year the best in the game's storied history - and we couldn't agree more! In fact, this month we are going to invite adventurers new and old to the table so that together, we can explore this amazing hobby one tool at a time and make sure you have everything you need to join the throngs of rabid RPG enthusiasts and of course, that D&D veterans to can discover new ways to improve their experience. Each week will have a theme featuring products and exciting content! Getting started with Dungeons & Dragons can be very intimidating. We will explore all the board games published by Wizards of the Coast and how they are great entryways for each campaign published by Wizards of the Coast. These games can help you explore the many realms, features, and characters of the Dungeons & Dragons universe without the staggering time commitment the RPG demands. We'll also cover the 5th Edition Starter Set and it's pre-rolled characters for the adventure The Lost Mine of Phandelver. Now it's time to make sure you have everything you need to start playing, whether you're a Dungeon Master or you're rolling up your first character. We'll also give you some insight into the amazing campaigns published by Wizards of the Coast so that you can choose your own adventure! We'll be sharing tips and tricks for building and customizing your miniature collection whether you're a proficient painter, a DM who needs to collect a lot of miniatures quickly to build out their campaign, or you want to find great options for pre-painted products. Want to take your adventuring to the next level? From customized maps and miniature decor, to ambience for your game room, to Spellbook Cards for all your characters, we've got you covered with all the accessories you can collect to ensure the best quest. That's not all! Starting on Monday July 30th, we will be starting our D&D: Let's Roll Giveaway! We want you to GET INVOLVED in D&D: Let's Roll. For participating in our weekly conversations and content with likes, public shares, and comments on Facebook, we'll be entering you for a chance to win the ENTIRE Dungeons & Dragons Campaign Library - including the upcoming Waterdeep Adventures: Dragon Heist and Dungeon of the Mad Mage. All this loot could be yours! For more information on how you can win, click here. Let us be your guide to the amazing world of Dungeons & Dragons. What say you? You bring the dice, we'll bring the discourse. Let's Roll!